Challenge: Virginia Commonwealth University Medical Center (VCU) has been ranked as Best Hospital in Virginia multiple times by U.S. News & World Report. They sought to improve the organization’s financial performance by reducing A/R days, optimizing cash collections and reducing the cost to collect in both the hospital and ambulatory settings. Result: In virtually every area of operation that impacts their bottom line, VCU has been able to reduce spending on administrative tasks, drive ever-stronger financial performance and devote more resources to delivering great care. 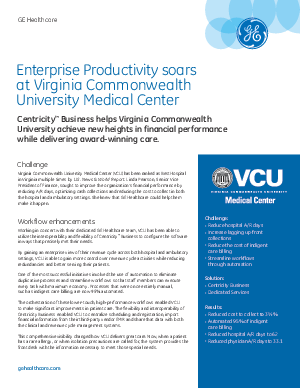 By working in partnership with GE Healthcare, VCU was able to drive greater profitability and efficiency while improving the patient experience. VCU was also able to reduce cost to collect, improve front-desk payment posting and co-pay rates, increase clean claim rates and more.